What’s not to love about a film which opens with animated credits like these? Very little! Especially when the credits probably cost more to produce than the entire rest of the film. This is a full-on Mod Seventies Cheesefest. I love cheese, and I love this film. 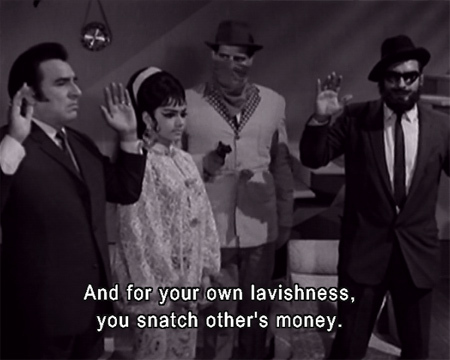 It is loony entertainment at its best: a comedy-horror-mystery-romance dressed up in bellbottoms and vivid polyester, set to lively pop music by Shankar Jaikishan, and populated by a large cast of character actors, comedians and dancers. Pran has a double role as a misogynistic ex-Army Colonel and as one of the Colonel’s charges Raghu, a campy effeminate type who nonetheless finds romance with one of the girls (when he isn’t busy combing his long hair). The girls are students of botany professor Laxmi (Sonia Sahni), a man-hating martinet, and her assistant Sister Sophia (Meena Roy). As with most Hindi horror genre films, there is a decidedly Christian bent (handy for grave-robbing situations). It was also filmed on location in a place I have visited, the Periyar Reserve in Thekkady, Kerala—very pretty and fun for me to see again. Although made in 1970, this film was clearly shot on a shoestring 1950’s budget by one of my favorite B-movie directors, Mohammed Hussain. It features a very carelessly put-together plot in the hands of a very beefy (some more uncharitable than I might call him paunchy) Dara Singh and his pals Bhagwan and Agha, who are actually very funny—yes, the Comic Side Plot entertains! Opposite Dara is the very lovely Shabnam, and they are supported by the goodness that is Madan Puri and Shetty as bad people. The songs by Dattaram are very lovely too. It shares a lot of quirky Hussain characteristics with the fab CID 909, although it’s a bit more muddled and not quite as much fun. It does make an adequate alternative for a rainy day’s watching if you’re in the mood for wacky nicknames and silly disguises and don’t need much of a story. Despite a silly plot filled to the brim with irresponsible adults and many creepy (as in “ewwwww” creepy) developments, I could not help but find this entertaining. 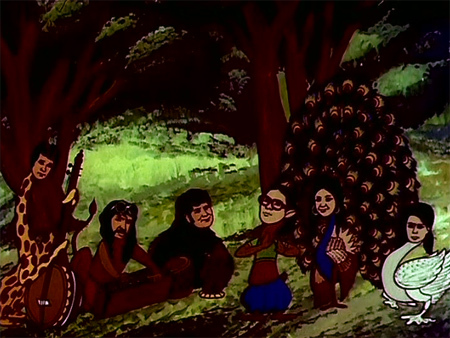 As noted in my previous trivia post, the film featured all of the best dancers of the era in several very fun songs: Laxmi Chhaya, Padma Khanna, Bindu, Faryal and Jayshree T, along with the inimitable and legendary Helen (who appeared as herself, and was given a well-deserved tribute in the dialogues). Hema Malini and a very young Neetu Singh had dances too, and Madan Mohan’s music along with the plentiful eye candy—both human and inanimate—conspired to prevent me from running away screaming as I should have, in all honesty. Warning: Post below contains many screen shots of dancing girls, so if they are not your thing you’ll need to use your scroll bar (although I must ask: how could they not be your thing? ).